I had to move to New York in 2009 and left this plant under the care of a friend. He tried, but didn’t quite know what to do. Upon returning last year, he gave it back to me. As you can see it had a near death experience. My dilemma is, should I leave it in the slate basket and let it recover naturally, or should I take it out and trim off the dead canes and repot it in fresh medium? I'm no expert but I would see what the roots are like and seperate soft from firm and mount instead of basket or pot. For me things in bad shape tends to rot and mounting helps prevent that from happening. I say take it apart and either repot, or as Solay suggested, mount it. There's a lot of dead stuff in there that should be removed. I agree with Solay too. Trim off the dead parts and mount it or put it in another open basket. Check how good the roots are on the new growth first if all those old bulbs full of air or mush remove them. If any firm ones near the new growths leave them as the new growths are taking energy from those unless the new growths have good roots established at this point. But if they aren't full of air dried up or mushy I'd leave any firm ones close to growths. My Den. aggregatum wasn't this bad off but my Den. jinkensii is. I unmounted, trimmed, and put into a container with moist hydroton. Now I have new growths that (if they survive) will give me new roots! It doesn't look too bad to me. Sure the middle is dead but that would eventually happen anyway. At least there is plenty of nice new green growth around the edges. I'm going to go against prevailing opinion and suggest just leaving it in the basket, in my experience these take a loong time to reestablish following repot or remount, even though this is the best time of year to do so. I agree with Dan that the plant looks okay as-is, especially for coming out of the dry season. I would soak the whole basket for 5-10 mins in a bucket of water with a few drops of KLN, Superthrive, or kelp extract, hang it outside in bright shade (if you have that available) and water as soon as approaching dryness, adding fertilizer once new growths appear. 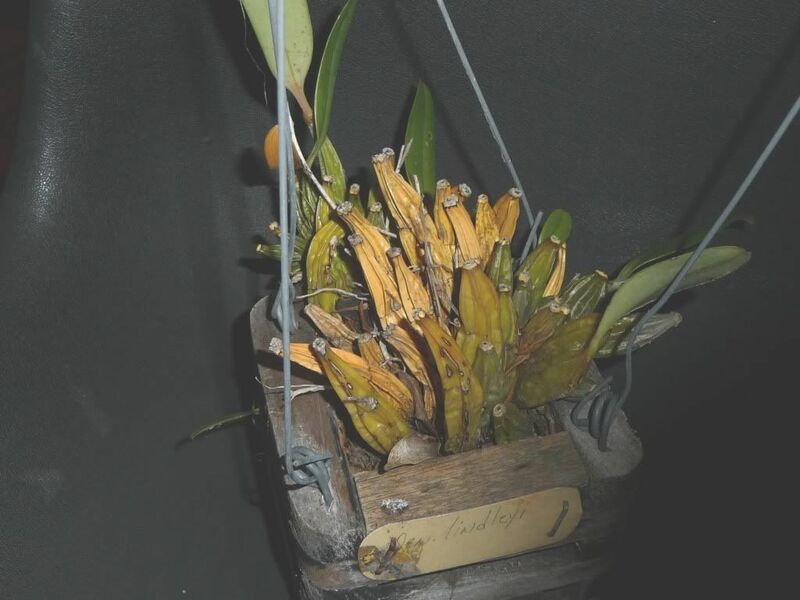 Alternatively, since the plant seems to have self-divided anyway you could pull one piece out to mount and leave the other in the basket. Good luck, whichever way you go with it! Nat, your idea is worth considering. 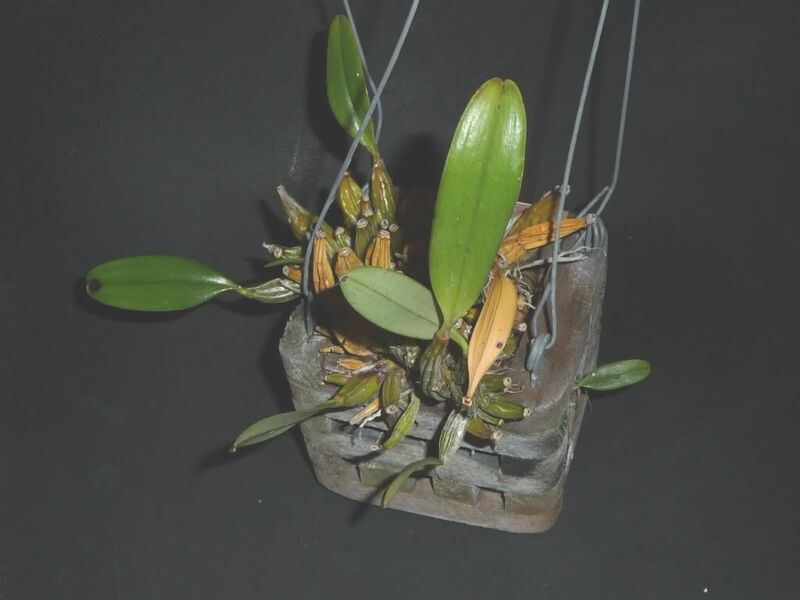 I loathe to pull an orchid out of a slate basket. It's like taking apart an appliance! I will try to soak it in superthrive. Also, should I give it more warmth? We've been having a very cold spring 60's day and 50's night. I recently gave some warmth to my Den. jenkinsii and it promptly sending out spike and growth. Repotting sometimes can be such a chore! Like my not so happy Grammatophyllum. I pulled it out its pot yesterday and thats it. I can't dig the old media out and I can't trim or else I will cut the good roots. Bah! I left it in a way too big net basket with no media and am gonna just let it do its own thing. I will, however, soak mine in some waaaay diluted Physan to fight off anything fungal deep inside and soak it in Kelp extract. That stuff works! Soaked all my new additions in it before repotting and haven't lost a flower - yet. And you can get it for pretty cheap at Calwest! If you don't mind the drive. I agree with Nat, Andrew. Tho its been a very wierd Spring so far, it will be warming up. I don't think the dead and dried up stuff is going to affect anything. It already looks like it's decided to thrive, despite everything. they would do this in nature, wouldn't they? When it's looking healthier and growing, then cut out the dried out dead stuff.